Commemorate your loved one that has passed away with a unique sympathy poetry picture frame. Our premium glossy prestige mahogany with gold accents wood moulding frames are smooth and lustrous with a brilliant shine to achieve a time-endured elegance. The personalized sympathy poem imprinted on the mat compliments the traditions use of contemporary designs. This keepsake timeless poetry memorial photo frame present beautifully highlights the meaningful poetry message that have sentimental value to your friend or family. By fusing a comforting and meaningful sympathy poem into a picture frame, which will support the grieving person, the end result is a really nice distinctive and unique memorable memorial gift. Our personalized bereavement poem photo frame gifts of comfort provide lasting memorable impression of the person that passed away. In memory of funeral gifts and presents are inspired by the caring words of our creative poets. 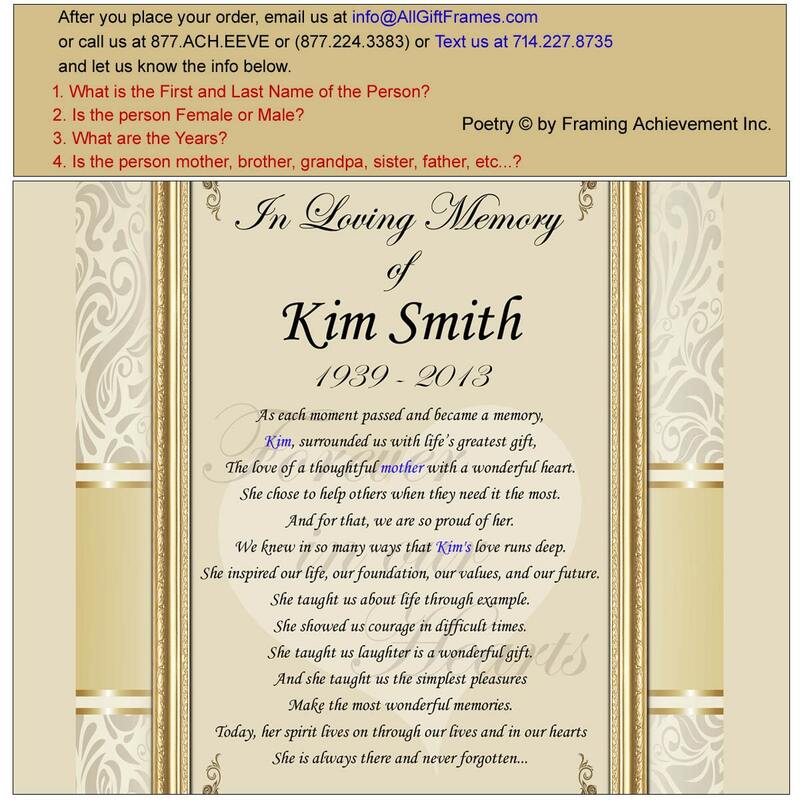 These funeral gift ideas with heartwarming poetry messages are an exclusive to Framing Achievement, Inc. creation. 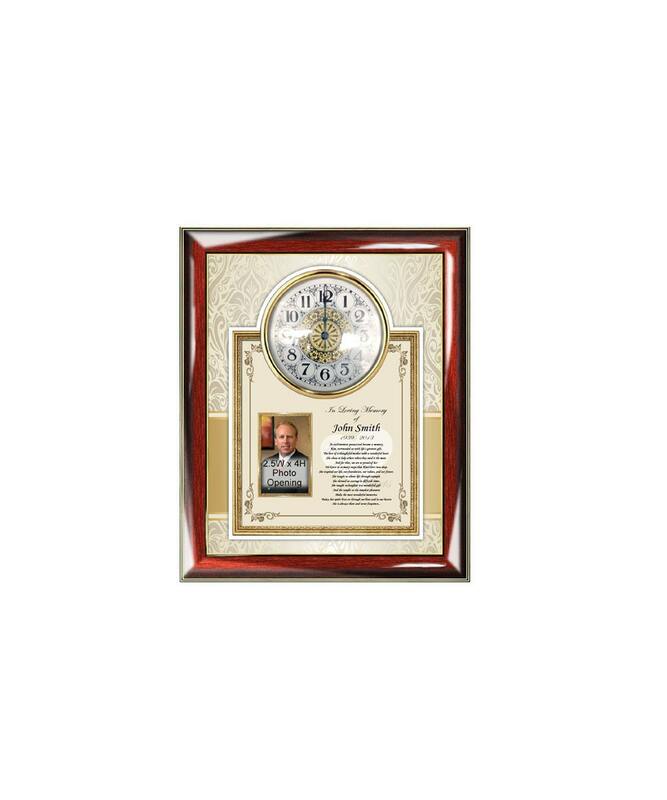 Express your gratitude to the person that loss a loved one with a customized clock gift. 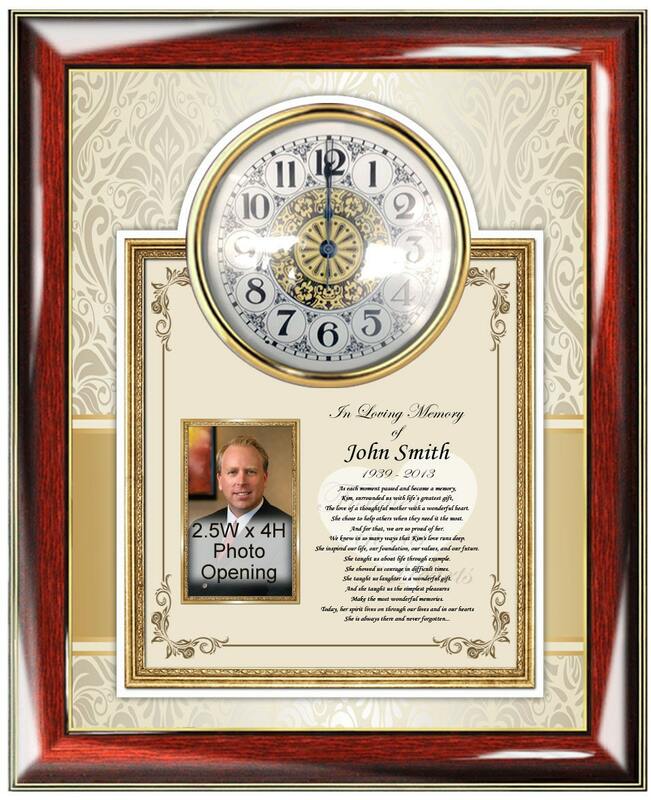 Our heartfelt poem clocks, engraved plaques and picture frames are customized with your name and embedded in the composition of the poetry gifts. Let our personalized funeral gifts of poetry products imagination wander and explore the possibilities that you can create with a custom sentimental meaningful message in our elegant memorial picture frames and clock gifts. Rating high on style and elegance, Framing Achievement's personalized poem gifts are the first choice in premium poetry presents for Anniversary, Birthdays, Weddings, Retirement, Graduation and many more occasions.